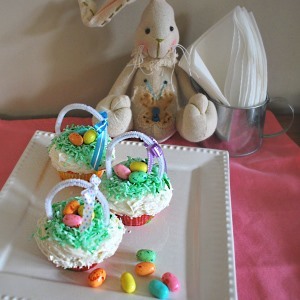 Jelly Bean Basket Cupcakes are perfect for an Easter Party or celebration. They are easy to make and make a cute centerpiece when put into a cupcake holder. Cute Easter Basket cupcakes decorated with a bow and chenille stem basket handle. Line muffin tin with liners. Bake cupcakes as directed on box or your recipe. Let cool completely and then frost with white cake frosting. Place white coconut in small ziplock and add a drop of food coloring. Shake bag up and down to spread color. Add another drop for a deeper color. Place a rounded spoonful of colored coconut on top of cupcake. With tip of spoon, hollow out the center a little by pushing coconut to form a nest shape. Place a dab of icing or frosting in the center of the "nest" to hold the candy eggs in place. Place about 3 candies inside of nest and press very gently to secure. Tie ribbon on pipe cleaner. It's much easier to do this first. Then cut length desired leaving about an inch on each side to poke into the cupcake on either side. Measure length for the rest of the cupcakes. Bend the pipe cleaner in an arc. Pink or yellow dyed shredded coconut would also be cute if you want variation in color. It just takes a drop of food coloring to color the coconut.